Whether a photographer looking to create your next masterpiece or simply a traveler ready to step away from mainstream tourism, Iceland should be at the top of your travel list. A land of extremes, Iceland is alive like few places on earth. It's rugged landscape beauty, climatic contrasts, friendly people and relative accessibility are a big part of it's soaring popularity. Frankly we can't get enough of it ( I've been 3 times and Layne 9! ). We're willing to wager once you go, you'll be hooked too. Skimming the edge of the Arctic Circle, Iceland truly is a land of fire and ice. Waterfalls? So many you'll quickly lose count. Volcanoes? Remember the eruption several years ago that shut down air travel? Eyjafjallajökull just rolls off your tongue. Beaches? Think black volcanic, glistening with ice diamonds. Icebergs? A lagoon full of infinite possibilities. Landscape? Vistas that change with every turn. The Icelandic language is a charming mystery you'll come to appreciate, with street signs longer than your arm, but English is widely spoken so you'll have no trouble interfacing with engaging locals. The food is amazing. Mouth watering cod, served more ways than your can imagine. Lamb, as an entrée or in ubiquitous stew, is another staple. If you've a taste for the exotic whale and reindeer can be on the menu, both exquisite. Leaving Reykjavik, home to ⅔ of Iceland's population, we'll venture into vast wilderness including some of the world's largest glaciers and so many active volcanoes that tremor activity is part of the daily weather forecast. Many Icelandic itineraries are limited to the Southern Coast, but we will explore the West Fjords, which fewer than 10% of visitors ever see. Jagged cliffs and broad beaches give way to immense mountains and jaw dropping fjords, home to traditional fishing villages and a different way of life. As you settle into the Icelandic rhythm, you'll marvel at conditions Viking descendants find easy to love. Worried about feeling chilled? Geothermal hot springs are an Icelandic tradition and some towns have free, hot spring-fed baths by the side of the road. Don't forget a bathing suit! Sun, wind, water, ice, fire. Iceland has it all. But it's the stark beauty shaped by primal forces that make Iceland so special for photographer. Stunning landscapes, pristine wilderness and unique wildlife will leave your heart as full as your memory card. Join Layne and Mark returning to a favorite destination! 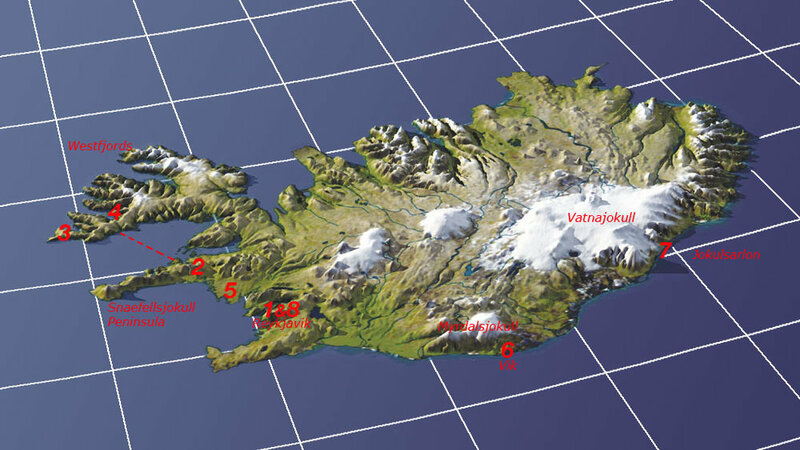 Head northwest from Reykjavik to the Snæfellsnes Peninsula. On the southern coast of Snæfellsnes we will photograph rugged coastline wilderness, where jagged cliffs and unusual rock formations are described as “Iceland in miniature”. Incredible natural spectacles and endless opportunities. Island hop from Stykkishólmur via ferry to the fjord region in northwest Iceland. Drive Iceland's picturesque south coast, dotted with dramatic coastlines, iconic waterfalls (Seljalandsfoss and Skógafoss), and rock formations sculpted by the wind and the elements (Dyrhólaey and Reynisfjara Black Sand Beach). There is so much beauty, the challenge is when not to stop. We will overnight in Vik, a storybook town sheltered by massive mountain ridges extending into the sea. One of Iceland's most fascinating bodies of water, 7 square miles of glacial melt from Vatnajokull (the worlds second largest glacier) link the glacier to the sea. Huge icebergs calve from the Breidamerkurjokull glacier face and drift across the huge lagoon, driven by the wind. They collide and fragment, eventually making their way to the ocean, littering surrounding beaches with polished ice glittering like sea diamonds. Jokulsarlon is another Icelandic location where any amount of time is never enough. We will sample Jökulsárlón and perhaps the adjacent beach in the morning light before departing for Reykjavik and a nights rest at the end of an amazing adventure.